Southern music composer M.S. Viswanathan, who has over 750 films to his credit, died at a private hospital here on Tuesday. He was 87. 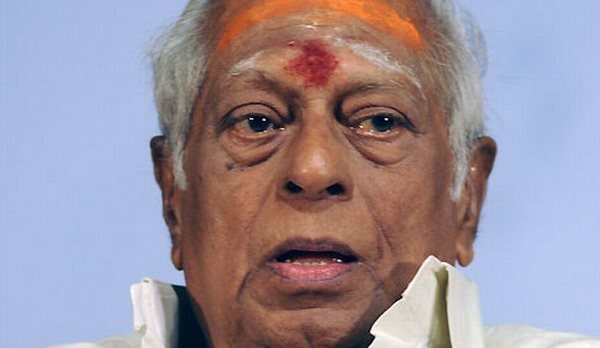 MSV, as he was fondly called by the members of Tamil filmdom, was undergoing treatment at Fortis Malar hospital for old-age related ailments and breathing problem. "He passed away around 4.30 a.m. on Tuesday," a family source told IANS. Popular for composing music in Tamil, Telugu and Malayalam industries, MSV started his career as a composer for 1952 film Tamil "Panam" starring Sivaji Ganeshan. MSV was popular for his collaboration with fellow composer T.K. Ramamurthy. The duo composed music for 86 Tamil films during their association of over a decade. Having started composing together in 1952, they split up in 1965. Some of their best films include "Paasamalara, "Sumaithaangi", "Server Sundaram", "Aayirathil Oruvan" and "Enga Veetu Pillai". Popularly known as 'king of light music' (Mellisai Mannar), Vishwanathan has also worked in Malayalam films such as "Manthrakodi", "Babu Mon", "Ullasa Yathra" and "Amme Anupamea". MSV and legendary filmmaker K. Balachander combination had produced several evergreen classics. Viswanathan's wife Janaki died in 2012. A year later, his best friend and composer T.K. Ramamurthy too died. He is a recipient of Kalamamani and several other music awards. MSV is survived by four sons and three daughters. His last rites will be performed on Wednesday.